I hate anything tight around my waist or my guts. So gaining just a couple of pounds has made sitting all day in my old pants a little less than comfortable. I went out one evening and tried on about 25 different maternity pants, to see if they might fit already and give me more comfort. It was a total failure. I still have no hips, and that is proving to be a challenge. So I took an old, unfavorite pair of Ann Taylor pants I had and decided to convert them myself. Combining an old cami with the pants, I turned them into maternity pants that fit me. The pictures on the floor make the pants look short and wide, but they aren't really. Due to an uncooperative husband, I am not smiling. Love the Prego Pants Conversion, love the creativity, love the hair, and love that you're Pregnant! I'm so happy for you. Oh, this is Kat's mom. I'm a blog stalker. :-) You are awesome and thanks for the chicken bundle recipe! An uncooperative husband? Never heard of such a thing. ;) You look darling! No, I can't really see your growing belly so I guess we better see you two in real life soon. Does Ryan also appear to be growing a baby in his belly yet? I hear most men gain some weight with their wives(only fair I guess!) Hope you are feeling good, you look great! Take care. Linda you are always welcome to come and visit! Annie, Ryan has actually been trying to lose a couple pounds, and the flu seems to have done it. Look how cute you are! And you are so creative. That is a great idea! how are you feeling by the way? I just went to Dr. Brown this week and thought of you. Wondering how the pregnancy is going. That's such a good idea. 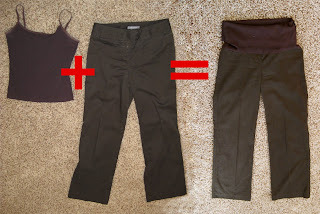 I'm going to have to do that next time because it is so hard to find good maternity pants! I had one pair I liked and I wore them waay too much. You can borrow them...but they're brown and look kind of like the ones you made so maybe you don't want to. If I use my imagination I might see a bit of a belly, but I also see two tinsy weensy arms. Oh, how I wish I had one-tenth of your creativity! I love your pants, and think you are a genius to have come up with the idea. BTW- congrats!!! (We talked to Ryan but I haven't talked to you yet) :) I am glad you haven't had morning sickness. I'm sure you'll get your energy back soon. Can't wait to see you with a cute little belly! :) We're so happy four you guys.